Almost all the instructions I'd seen for flat herringbone stitch projects started with a base row of another stitch, usually ladder stitch. So when I saw today's free project, I was momentarily flummoxed. Begin herringbone without ladder stitch? I felt like the Peanuts character Linus must have felt when he lost his security blanket! 1. Start with a 2-beads-at-a-time ladder. (See the ladder stitch illustration if you need help with this step.) Exit out of the end bead in Row 1. 2. Pass through the second bead from the end of Row 1 through the end bead of Row 2. Now your needle is facing the correct way to begin Step 3. 3. 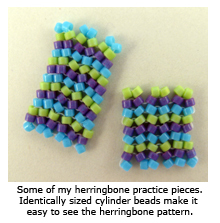 Add pairs of beads for your first row of herringbone. 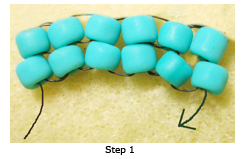 String 2 beads, pass down through the second bead from the end, and up through the third bead. 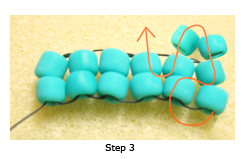 Add 2 more pairs of beads to finish the row. 4. 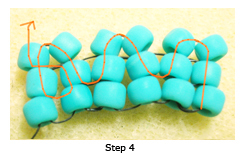 At the end of each row, pass through the end bead in the row below, up through the second bead from the end, and then up through the end bead of the top row. Now you are ready to start another row of herringbone stitch. So tell me–Which method do you prefer? Which do you use? Which would you teach a beginner? Share your tips on the website. 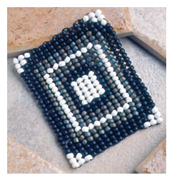 Use this home decor project from the Winter 1998 issue of Beadwork to learn flat herringbone stitch, also sometimes known as Ndebele stitch. This project uses baseless herringbone stitch, meaning that it does not start with another stitch like ladder stitch or peyote stitch. If you'd prefer something wearable (but still easy enough for a beginner), check out the Colorblock Cuff by Perie Brown or Tina Koyama's Diagonal Tweed. Both of those patterns begin with a ladder stitch start. Michelle Recommends: For a handy stitch guide to tote while you're traveling this summer, check out The Beader's Companion by Judith Durant and Jean Campbell (yes, the same Jean Campbell who writes here every Wednesday!). It includes illustrations and beaded samples of all the stitches, so it's easy to get a quick refresher any time. It also has bead size charts, a quick guide to common gemstones, types of bead finishes, different types of knots, lists of stringing materials and tools . . . pretty much anything you can think of that's bead-related. It's the reference book I use most when I'm writing for Beading Daily! Remember–Voting for Bead Star ends May 30, 2009. Help choose the winners who will appear in the next issue of Bead Star!